Weather had a significant impact on Friday night’s action as several games were either delayed or postponed. What did we learn after sorting out the results from Week 5? We learned that there is a lot of parity in the largest classes as Class 6A and 5A continue to see several changes in the top five rankings. 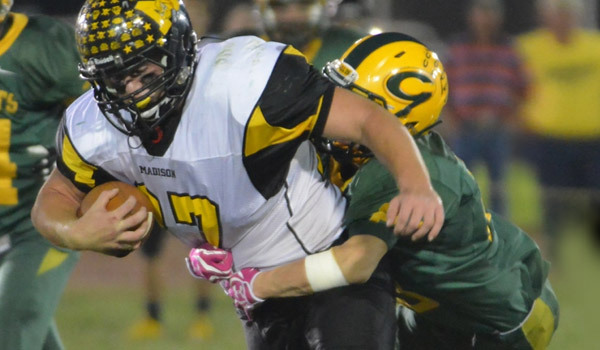 Here are the Week 6 Kpreps.com rankings powered by Pinamonti Physical Therapy. There is a new No. 1 in Class 6A for the third time this season and the second time in as many weeks as Lawrence Free State lost 26-19 at Olathe North on Thursday night. The Firebirds fell behind 26-7 in the second half but rallied to pull within a touchdown late on a pass from Joe Dineen to Khadre Lane. Free State recovered an onside kick, but Dineen was intercepted on the next play sealing the game for the Eagles. Free State’s loss means that Derby is back on top of Class 6A where they began the season. The Panthers cruised past Haysville Campus as a tune-up for Hutchinson this week. The Salthawks fell out of the 6A poll after being beaten 48-10 by Salina South. Shawnee Mission East enters the poll at No. 3 this week after an overtime win over Shawnee Mission South. The Lancers have won each of their last three games in dramatic fashion and host Free State this week. Topeka High moves up one spot to No. 4 this week, and Gardner-Edgerton returns to the poll at No. 5. In Class 5A, the top two spots remain the same as Bishop Carroll remains at No. 1 despite struggling past Wichita Northwest 12-7, and No.2 Bishop Miege had no trouble getting past Blue Valley Southwest 37-12. After that, things get complicated. Blue Valley and Blue Valley West each suffered three-point losses and dropped out of this week’s poll. Salina South jumps back into the 5A poll after dominating Hutchinson for a second consecutive season. Mill Valley moves up one spot to No. 4 after shutting down Bonner Springs 23-9, and Kapaun Mount Carmel slides into the rankings at No. 5 ahead of their showdown with arch rival and top-ranked Bishop Carroll this week. The top five teams in Class 4A all remain the same as each ranked team put up at least 40 points. Top-ranked Holton scored 43 in their win over Perry-Lecompton even though it was called at halftime due to weather. Andale hammered Augusta 73-6 and No. 3 Baldwin had to wait until Saturday, but beat De Soto 49-7. Buhler handled El Dorado to stay at No. 4, and Coffeyville outscored Chanute 56-27 and will travel to unbeaten Pittsburg in Week 6. Silver Lake trailed their Mid-East League rival St. Marys entering the fourth quarter, but the Eagles won despite the services of starting quarterback Dailin Kruger. Beloit remains at No.2 after posting 72 points in a win over Ellsworth, and Conway Springs is No. 3 after handing Wichita Trinity its first loss. This week marks the War on 24 as No. 4 Rossville travels to No. 1 Silver Lake in their annual showdown. Conway Springs hosts rival Garden Plain in the Central Plains League. In Class 2-1A, the top five teams remain the same as district play kicked off for the majority of the classification. Lyndon remains at No. 5 thanks to a narrow 27-25 district win over Olpe in a game that started late on Friday night. Olpe drove inside the Lyndon 10-yard line late in the game, but penalties backed the Eagles up and they ended up missing a field goal as time expired. Definitely the wildest game of the week took place in Chetopa where top-ranked Madison won a shootout over the previously unbeaten Green Hornets, 92-56. Yes, you read that correctly. Madison built a 46-14 lead in the second quarter before Chetopa answered with 22 points before the half to pull within 46-36. The Hornets pulled within 52-44 in the third quarter before Madison’s power running game took over and produced 32 consecutive points. Elsewhere in 8-Man, Division I, No. 2 Kiowa County rallied for two, fourth-quarter touchdowns by Trever Powell to top South Central 32-18 in a battle of unbeaten teams. Finally in 8-Man Division II, Sharon Springs-Wallace County won the battle of ranked teams on Saturday by defeating Hanover 22-6. Hanover couldn’t overcome several turnovers and falls for the first time this season. The two sets of Wildcats trade places in the poll as Sharon Springs-Wallace County moves up to No. 2, and Hanover drops one spot to No. 3.